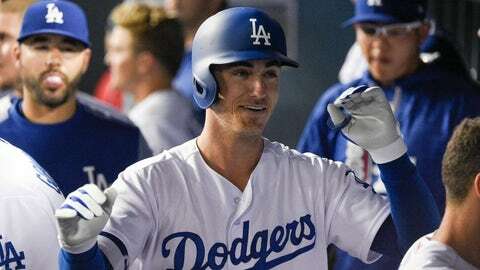 Cody Bellinger possesses that rarest of baseball gifts. Lombard said that the Dodgers’ staff didn’t know Bellinger all that well when they first saw him in the spring of 2016. His arm proved better than they expected. He ran better than they expected. And his power … it’s doubtful that even Bellinger’s father – former major-league infielder/outfielder Clay Bellinger – expected this. Cody, 21, played in just his 32nd career game on Monday, and became the fastest rookie in Dodgers history to reach 11 home runs. He has two games left to hit his 10th homer in May and break the team record for most homers by a rookie in a calendar month. The Dodgers fully expect the league to adjust to Bellinger, who overall is batting .271 with a .951 OPS. His uppercut swing is quick but long, leaving him susceptible to hard throwers – and he already has struck out 40 times in 118 at-bats. Still, manager Dave Roberts said that Bellinger is smart and athletic enough to make his own adjustments, even play a cat-and-mouse game with pitchers. For all his talent, Bellinger is a born grinder, the son of a player who spent 10 years in the minors. Bellinger, after playing mostly first base in the minors, has moved to left field for the Dodgers now that first baseman Adrian Gonzalez is healthy and left fielder Andrew Toles is out for the season with a torn right ACL. 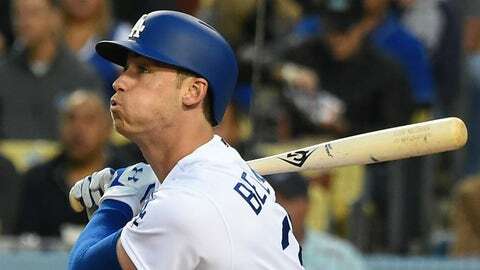 The Dodgers like what they see; Bellinger, in addition to his homer Monday, threw out the Cardinals’ Paul DeJong trying to score from second on a ball that bounced off shortstop Corey Seager’s glove into left field. Per Statcast, Bellinger also has the sixth-fastest running times for a triple this season – 11.06 seconds against the Giants on May 2. The players who rank ahead of him – Billy Hamilton, Byron Buxton, Dee Gordon and others – are some of the fastest in the game. Fun player to watch. And he only figures to get better. 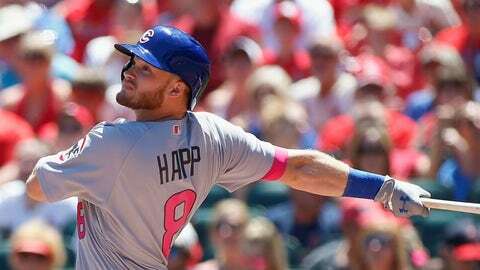 Speaking of young talents, Ian Happ is in a 2-for-22 slide, but the Cubs rave about his mature, serious-minded approach; hitting coach John Mallee says that Happ knows his swing the way veterans do even though he is only 22. Happ grew up in Pittsburgh, and his mentor is none other than the former major-league first baseman known as “The Mayor,” Sean Casey. The two met at a suburban Pittsburgh gym when Happ was in high school, and Casey gave Happ the Harvey Dorfman book, “The Mental Keys to Hitting.” Casey told Happ to read the book every day, act on its instructions and never waste a pitch. Happ still carries the book in his backpack. On the subject of Happ, it’s worth noting as well how seamlessly Cubs manager Joe Maddon incorporates young players without complaint. Maddon had no choice but to do that during his days with the Rays, but his openness to youngsters is one of the things the Cubs’ front office likes best about him. Maddon said he learned the value of a young player’s confidence when he was a minor-league instructor with the Angels and Wally Joyner came up through the team’s system. Joyner announced to Maddon one day that he was going to replace Hall of Famer Rod Carew at first base. Maddon said that he thought the remark was a little much, but he loved how Joyner believed in himself. Happ is that way, and so are many of the Cubs’ other young stars. ERVIN: TO TRADE OR NOT TO TRADE? 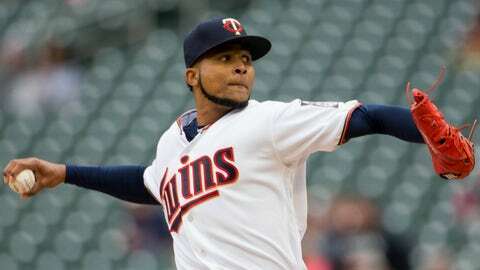 The Twins face a fascinating call with right-hander Ervin Santana, who is signed through next season at $13.5 million annually and has a $14 million vesting or club option for 2019. Santana, 34, leads the majors with a 1.75 ERA. His .145 batting average against on balls in play is a reflection not just of the Twins’ improved defense, but also of good luck. Still, his run of recent dominance actually dates to last July 1 – in 27 starts since then, his ERA in 180 2/3 innings is 2.14. The Twins’ first-place standing in the AL Central might be something of an illusion – their run differential is minus-7. Still, there is value to keeping Santana in combination with Jose Berrios as the team continues to retool. The bottom line: The ask for Santana figures to be quite high – a stunning development for a pitcher who was suspended 80 games after testing positive for PEDs in 2015. 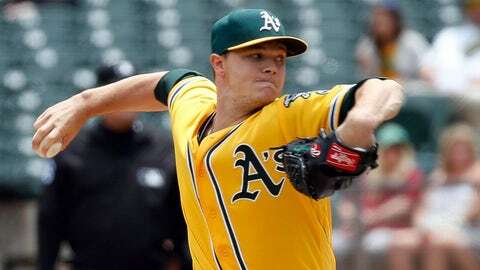 Athletics right-hander Sonny Gray is under the same amount of club control that Indians lefty Andrew Miller was a year ago – two-plus seasons, or three pennant races. So, if Gray stays on a roll, what might he be worth in trade? The Yankees acquired outfielder Clint Frazier, left-hander Justus Sheffield and righties Ben Heller and J.P. Feyereisen for Miller, who pitches 60 to 70 innings per season (albeit 60 to 70 of the best innings you’ll see). Gray exceeded 200 innings in 2014 and ’15, but has dealt with forearm, trapezius and shoulder issues the past two seasons. Add second baseman Jed Lowrie to the list of players on whom the Athletics will field trade offers – Lowrie, batting .293 with an .837 OPS, has been one of the team’s best hitters, and his relatively modest contract includes a $6.5 million salary for this season and $6 million club option for 2018. First baseman Yonder Alonso, a potential free agent, is an even more obvious trade candidate – his OPS is 1.020 to Eric Hosmer’s .801. But as I’ve detailed previously on Hosmer, finding a contender with an opening/need at first base might not be easy. Left fielder Khris Davis, who has 16 homers, might not draw the expected demand for different reasons – the free agencies of Mark Trumbo, Mike Napoli and Chris Carter showed that teams are placing less value on high-strikeout sluggers. Davis’ salary likely will rise from $5 million to approximately $10 million next season in arbitration. 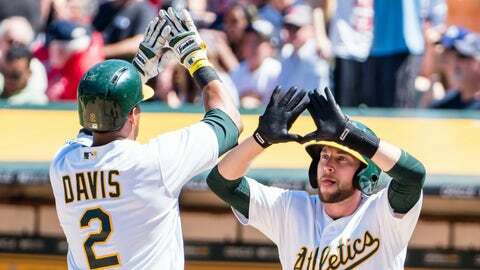 The A’s also could control him for one more year after that, retaining credibility in the middle of their lineup. Given the current market forces, it might be their best play. May 18: Braves sign Loney to minor-league contract on same day they place first baseman Freddie Freeman on the disabled list with a fractured left wrist. May 20: Braves acquire first baseman Matt Adams and cash from the Cardinals for minor-league infielder Juan Yepez. May 22: Braves release Loney. The sequence raised an obvious question: Why did the Braves sign Loney if they were about to trade for Adams? The answer, general manager John Coppolella said, was that the Braves were not yet in talks with the Cardinals when they made the move for Loney. Coppolella added that even after the discussions began, he was not necessarily confident that he would land Adams. Coppolella said that the Braves offered Loney the chance to remain in the organization, serve as insurance for Adams and showcase himself for the other 29 clubs. 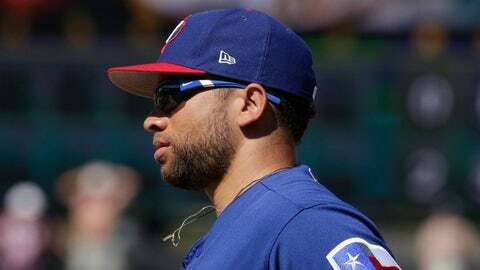 Loney, however, preferred to be released for the third time since March 27 – he earlier was let go by the Rangers and Tigers. He has yet to sign with another club. 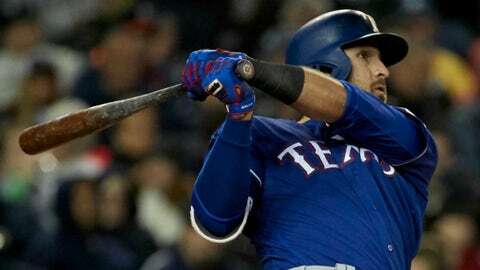 *The Rangers’ Joey Gallo stands a chance of becoming the first player to finish with a batting average below .200, on-base percentage above .300 and slugging percentage above .500, minimum 100 at-bats. Gallo went 2-for-4 with his 16th homer on Monday to raise his overall line to .205-.313-.548. He will play mostly left field now that third baseman Adrian Beltre is back, but also will see time at third and first when Beltre and Mike Napoli get days off or DH. *Maddon described Kyle Schwarber as “dented” mentally by his recent slump, and speaking generally said the Cubs had a lot of “young at-bats” in their lineup. Kris Bryant is the exception among the Cubs’ younger players, using the opposite field, taking his walks and even beating out slow rollers on occasion. “He does different things to prevent himself from getting in elongated moments,” Maddon said. *Rays right-hander Erasmo Ramirez gets a pass for lasting only 2 1/3 innings in his start against the Rangers on Monday night after earning the save the day before in the Rays’ 15-inning victory over the Twins. Prior to Monday night, Ramirez had a 3.32 ERA over 173 1/3 innings in 31 starts since joining the Rays in 2015. He has been slightly less effective as a reliever, but Rays officials love that he does whatever they ask without complaint. 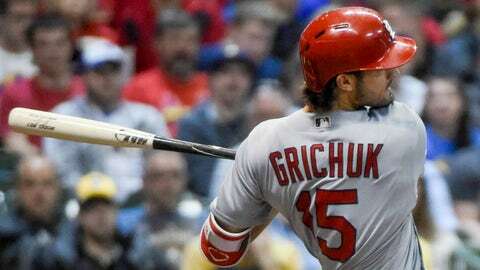 *It wasn’t long ago that Cardinals GM John Mozeliak predicted that Randal Grichuk could be a 30-homer man. Grichuk came close last season, hitting 24 homers with a .769 OPS. But on Monday, the Cardinals demoted him to Class A so that he could work on his strike-zone management. Grichuk is still just 25, and he defends well in both outfield corners. But his career on-base percentage is .298, and he might be running out of chances, particularly if Tommy Pham proves a worthy replacement. “He’s hanging in there. We had talked as a group – John Hart, myself, Brian Snitker, our coaching staff. We talked to guys like Bobby Cox, John Schuerholz, Dale Murphy. To a man, our whole Braves family felt like this is a guy who has the talent and makeup to where he could figure it out up here.